My family can tell you that I don’t like being in total darkness or feeling trapped. I recall waking up in the middle of the night clawing at the zipper in a tiny pup tent many years ago during a short-lived camping era before we had children. I remember all too well how hard I had to work to fall asleep in the impenetrable darkness, compounded by the close quarters of a European hotel room once upon a time. More often than not, I have cracked many a curtain or blind or shade to make sure I can “see” in the dark when in an unfamiliar place. I was fascinated then, with a Facebook friend’s Lenten post to this link, which became the inspiration for this week’s blog post. That find led to my recollection that Barbara Brown Taylor’s Learning to Walk in the Dark has been sitting on my shelf unread since soon after its release two years ago just before Holy week, prime time for the publication of a book about darkness. I read it through quickly and found comments by others, some of which are recorded here, helpful as I digested Taylor’s words about walking in the dark. Also author of the best-selling An Altar in the World, Taylor “challenges our negative associations with darkness and our attraction to light...She draws on her own experiences—from exploring caves and experimenting with blindness, to her questioning of her own religious training and faith—to explore what might be gained by embracing darkness. What she finds are the possibilities of emotional healing, a deeper appreciation of silence, living in the now, and peace of mind where there once was fear,” according to Spirituality and Health magazine’s assessment of the book. In an interview with Taylor, which appeared in his On Faith & Culture e-column for Religion News Service, Jonathan Merritt asks her about her understanding of the use of the word darkness in scripture. Acknowledging that most biblical references to darkness are negative (referencing ignorance, sin, evil, death), Taylor says she believes that many positive things happen in darkness as described in Bible stories. Taylor concludes in her conversation with Merritt that “the great hope in the Christian message is not that you will be rescued from the dark, but that, if you are able to trust God all the way into the dark, you may be surprised.” Attempting to rehabilitate our fear of the dark, according to her book jacket, Taylor “reflects on how our lives do not work only when everything is fully lit. We can’t always see the light. It waxes and wanes or can go out altogether. What we need is a spirituality that works in the nighttime. Though she says she does not intend to underplay the importance of light in scripture, Taylor critiques some current-day churches for practicing a “full solar spirituality” with no mention of finding “healing and liberation” in the darkness as well. Perhaps this Lent is a good time to turn from deadly scripts we have been taught about darkness. How might we begin to learn to walk in the dark without fear? What tiny steps might we take to travel where the light is dim? What props might help build up our courage to take those steps? (See lighted pathway in the dark in the photo above, snapped at Vic and Nancy’s Longest Night observance in 2014.) 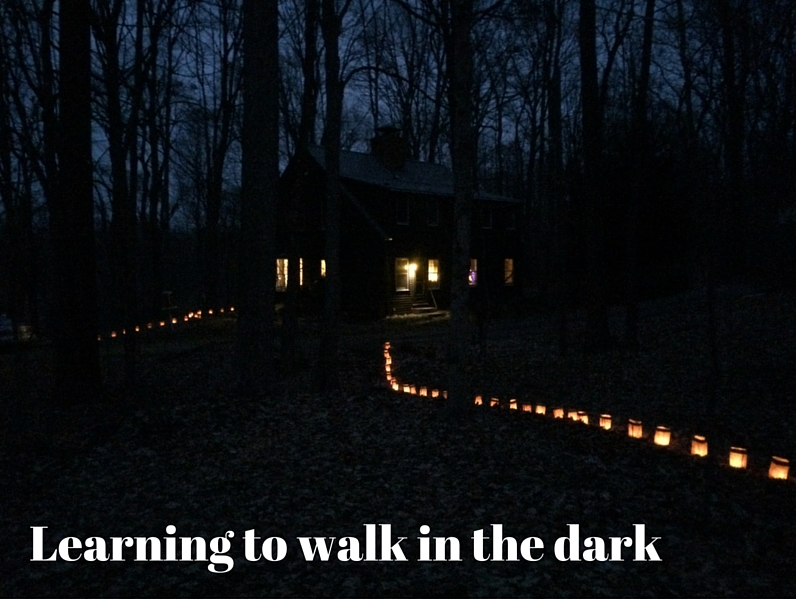 How might we encourage others to risk learning to walk in darkness? May we continue to unearth our living stories and new narratives this Lenten season, especially amidst our timid stumbles into the darkness.